Digital downloads continue to become a larger and larger part of the music industry's overall sales. 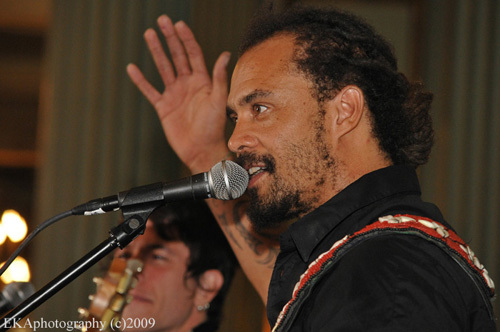 A good example of this is Michael Franti, whose iTunes Top Twenty single "Say Hey (I Love You)" recently passed the 120,000 mark - making it the biggest-selling single of his career. The song also currently stands at #1 on Media Base's Hot AC Indie Label Chart and #3 on the Indie Label Chart. "Say Hey (I Love You)" is a song about life's journey," Franti said in a press release. "No matter where it takes us, no matter how hard it may seem to understand at times, there is one thing we know for sure...we love the people who are closest to us." He adds, "People are smiling on this song because in these uncertain times people are connecting with what they value most, friends, family and togetherness." Franti headlines the 31th annual Harmony Festival June 13 in Santa Rosa, before launching the "Saturday Night Rebel Rockers Traveling Circus & Medicine Show," a summer tour also featuring Counting Crows and Augustana. Harmony Fest tickets are here.